For Tall Ships Weekend, Orkney Heritage Society in conjunction with Orkney Archive has prepared a small exhibition about the history of Kirkwall Pier which is 200 years old this year. Thomas Telford prepared the original designs for the Pier and the display which will be on show at the Pier has extracts from original documents from the Orkney Archive showing the local businessmen who paid for half of the costs of the Pier, Telford's original specifications and how the Pier has developed to the present day. There are also photographs of the Pier in different eras, including this one from the 1860's. Interesting pictures Leslie, thanks for sharing them. I suspect this might be a very rare image by John Traill Taylor (1827-1895) who visited Orkney as "John Traill" in June 1860 on board the Prince Consort. Rather than 'arriving' this is more likely the ship leaving. See my previous post with an account of his visit by John Traill, from the British Journal of Photography, 1 August 1861. He would become editor of the BJP in 1864. I can now update my previous comment! 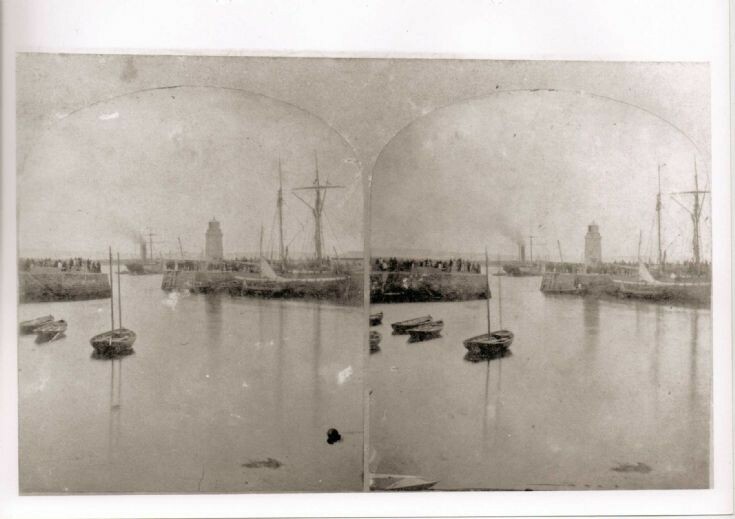 This is in fact a stereo view by Charles Hubbard who advertised 'Orcadian Views' in the Illustrated London News in August 1861. He was a bird stuffer and photographer from Norfolk and was a fairly regular visitor to the Highland and Islands of Scotland where he shot birds for sale to museums across the country. It turns out that there are no known surviving photographs by John Traill Taylor.